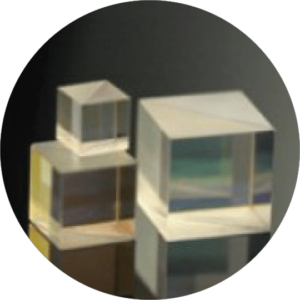 Shanghai Optics is one of the leading optical component suppliers that offers Non-Polarizing Beamsplitters for the Visible (400-700nm), NIR (700-1100nm), and Telecom (1100-1620nm) ranges. The low polarization dependence of the metallic/dielectric hybrid coating allows the transmission and reflection for S- and P-polarization states to be within 6% of each other. These Beamsplitters are spectrally flat across their specified wavelength ranges, making them ideal for use with a variety of laser wavelengths. The spectral flatness also reduces effects that are due to changes in the angle of incidence or converging/diverging beams. Each Beamsplitter consists of a pair of precision high tolerance Right Angle Prisms cemented together with a metallic dielectric coating on the hypotenuse of one of the Prisms. A broadband antireflective (BBAR) coating has been applied to each face of the Beamsplitter in order to produce maximum transmission efficiency for the appropriate wavelength range.